It was great timing for Chihuahua to launch their brunch menu. Not only for Cinco de Mayo but I have been craving for texmex for breakfast recently. I brought along a friend who had never been there and she was the perfect companion since we were craving the same thing. 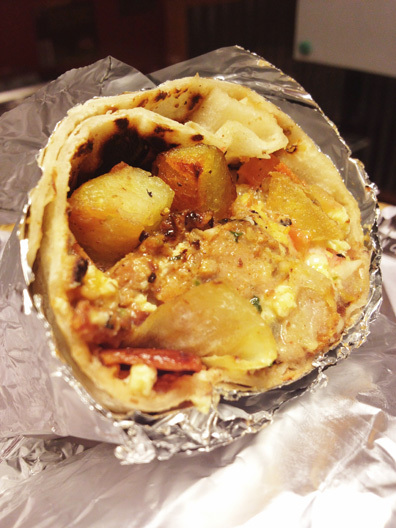 We started with the Breakfast Burrito stuffed with a sour creamy scrambled egg, queso, Mexican chorizo, refried beans, salsa, pico de gallo, chunky country potatoes and a surprise strip of bacon in the middle! The burrito is good to share between two people but we came ready for this feast. 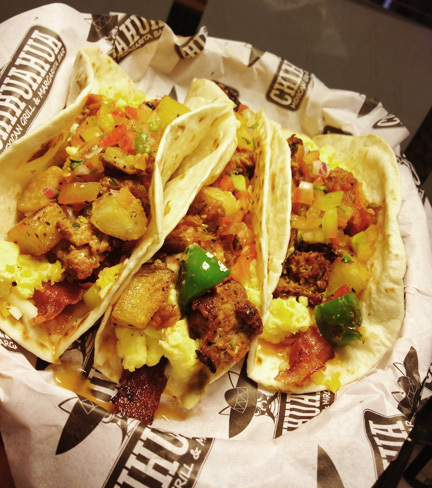 We also tried the Breakfast Tacos. It’s the open-faced version of the burrito, sans the beans. Elian came over to our table and let us try one of the chili sauces he and Ines brought back from their recent trip. Sadly, I forgot its name but it resembles a bottle of Jack Daniels. Our meal didn’t quite end yet. 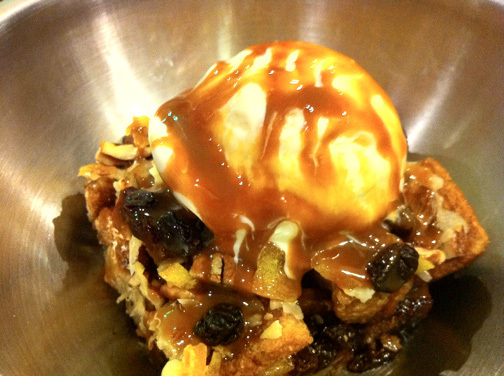 For our brunch finale we had… the Capirotada; a Mexican version of bread pudding loaded with dried fruits, nuts with hints of Monterey Jack Cheese. It’s topped with a giant scoop of vanilla ice cream and drizzled with the mexican version of dulce de leche, cajeta. This dessert is as huge as a brick! Though that still didn’t stop us from polishing it off. We happily waddled out of Chihuahua. It was my first time to visit the place in the daytime and the experience and quality they provide is consistent. I would definitely go back to try the interesting brunch cocktails and I still have my eye on the Breakfast Burrito Bowl for next time. You had me at waddle.